Franklin_3, originally uploaded by Pete Sieger. 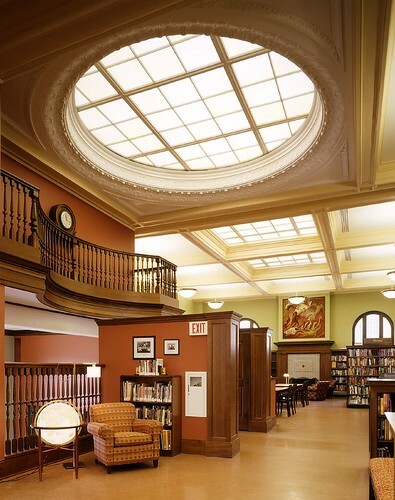 Pete Sieger has an incredible series of photos of the new Franklin Library posted to his Flickr account. The place looks beautiful, and Sieger’s photography skills are clearly first rate. One thing I didn’t see much of in the series is photos of computers. Does anyone know what the computer scene is at the library? I like the giggling in the car. Clearly, we were enjoying the show. Thanks to our local Clark Griswold, we’re really have the holiday spirit now. Yet another link pick-up for The Deets. This time from fellow Cooper neighborhood resident and blogger, Aaron Landry. Aaron documents goings on by moblogging with his hiptop. Aaron does a great job aggregating 3rd party site content onto his blog. He’s pulling in events he’s going to attend from Upcoming, bookmarks from del.icio.us, dodgeball checkin history, last.fm listening log, and his Flickr photo feed. Very cool. That’s an awesome way to create fresh content for your blog by just doing your thang. If you don’t happen to be familiar with the Cooper neighborhood, you can read all about it on the Wikipedia page about Cooper I started. While I’ve previously reported that I’m big in Minnesota, that’s nothing compared to being big in South Minneapolis. Imagine my excitement when I found out that a Longfellow blog, Jackalope Ranch, added a link to The Deets. It’s worth noting that while Mike of JR and I both live in the Longfellow neighborhood, we are not neighbors. Mike resides in SoLo, aka. South Longfellow, while I’m in NoLo. Or am I in NoLo? Heck, I can’t remember. I believe the terms were coined by Mike, so maybe he can explain in the comments or on Jackalope Ranch. Jackalope Ranch may seem like a strange name for a blog based in Minneapolis. Seriously, when was the last time you saw a jackalope running across the street in South Minneapolis. It’s rare to even find one mounted above the mantel in a South Minneapolis bungalow. It turns out that Mike’s some kind of transient who once drank a Lone Star while watching a Spurs game, so considers himself Texan. At least, that’s my one sentence explanation. 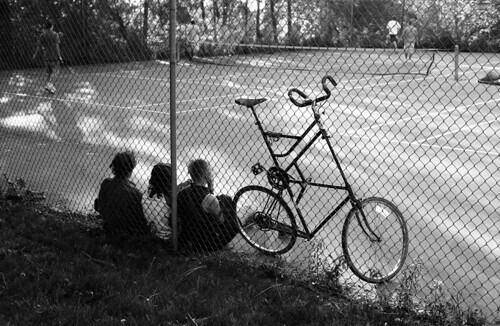 bikes_02, originally uploaded by @ndyK. What’s with Minneapolis and crazy bike styles? Check this thing out. I think I’ve seen this one roll down Washington Ave while consuming some beers & chicken wings at Maxwell’s before. Just to clarify, I was the one consuming; not the biker, who would likely have a hard time working on a wingie or drummie while handling this ride. I suppose give a choice, drummies would be preferred for Buffalo biking. Flying Dallin, originally uploaded by zelph. One of my favorite photo pools on Flickr is the WOW! pool where only photos with a WOW! factor are supposed to be contributed. While that’s a fairly subjective thing (cats? please), there really are some gems. Some of the most impressive photos to me come from places I’ve never seen before, such as exotic beaches, hiking trails, and small cities around the world. You can subscribe to a pool’s photos by adding the RSS feed URL found at the bottom of each pool’s page. 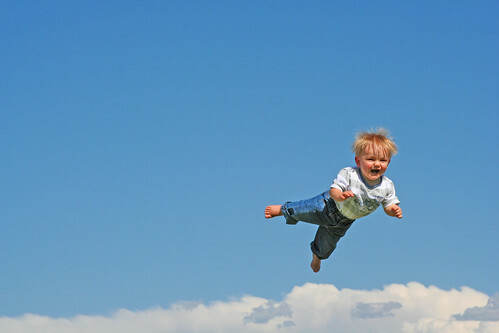 Cute kid photos are a really questionable submission, but flying kids have serious WOW! factor. Another interesting feed is photos tagged with the term Minneapolis. Photos of cool stuff going on around town come directly to me in Bloglines through this feed. Cool stuff. Mill City Museum, originally uploaded by megan.frick. During a tour of the Mill City Museum in downtown Minneapolis the tour guide explained that flour dust accumulating within a mill can be EXTREMELY dangerous. How dangerous? The rebuilt brick walls of the museum from times when the building literally blew up illustrate the power of exploding flour dust very well. So mills had to figure out a way to deal with flour dust. Back in the day, companies like Gold Medal Flour (pictured here) would use fans to simply blow flour dust out of the building. And where did that flour dust end up? In the river, where it made the Mississippi very doughy. Apparently, the area of the river just below the mills was home to insanely large carp who gorged on the dough. Eventually, the EPA of the time stepped in and said, “No more polluting” so the mills created an internal fan that would blow the flour dust into a conical pipe that caused the dust to settle into a bin that could be safely disposed of. Fast forward to this week when I shopped a tad too fast at the grocery store on the way into work. I mistakenly purchased PULP FREE orange juice rather than real orange juice with it’s natural pulpiness. This made me wonder: what happens to the pulp removed to create pulp-free orange juice? Is it possible that somewhere in Florida there exists a dumping ground for excess pulp? I can imagine large swaths of the Everglades being home to ginormous anti-oxidized manatees who spend all day foraging on endless supplies of fresh pulp dumpings. Perhaps Katherine Harris and Mark Foley can head up a blue ribbon commission to investigate Florida orange pulp dumping now that they’re looking for jobs?